Enter a patient’s account details. Select the Account Payment tab. 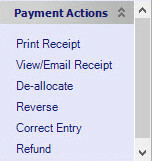 Highlight the payment(s) you want to correct or reverse by clicking on it in the Payments list. Tick “Show All” if it is not visible. Click on Refund in the right-hand menu. Enter the details as prompted and click OK.